Never quite sure whether to put an apostrophe in the post title with this kind of place. But since there's none in their sign I'm going to leave it out. It's their cafe after all. And this is a fantastic place. 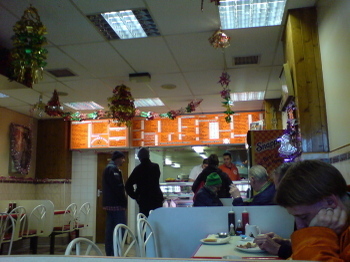 Amid the nicknackery shops of the metropolitan elite is this refuge of fabulous fried food and tabloid newspapers. They cover all the meals. With pictures if you're not sure what each of them generally comprises. High quality ebcb, nicely cooked and an extra dark brown dollop of sauce which looks slightly like a proto alien from Torchwood, something that's just an interstellar blob at the moment but which the special effects folk will soon transform into something sinister. The bacon will be its first innocent victim, pale, wan and unsuspecting. I imagine the chips will put up more resistance, there's quite a lot of them, and the beans'll be hard to defeat because they're so slippery. The egg will be its downfall though, the inner eggy core is well known to be kryptonite to blobby sauce monsters. 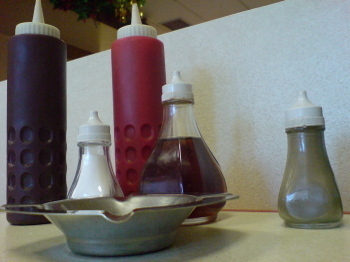 And when you think about it like that, these condiments seem quite sinister too. Anyway, it's a great place. Big and light with colourful graphics and all the staff in logo'd t-shirts. Shows they care. Have you been to River Cafe opposite Putney Bridge station yet? 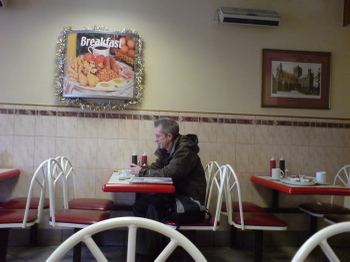 I used to go there and eat egg, chips and beans before Fulham matches a decade ago. It gives me great pleasure to now watch my son eat the same egg chips and beans at the same tables with the same faded Juventus posters on the walls. This looks like one of those "dives" that doesn't look like much but has the best food! I love places like this! I've often been past this cafe and thought about wondering in...might just do that now! Round the corner, though (well, on Holloway Road so quite a long corner) is a delightful establishment called Paradise Cafe, my regular at the moment. Fantastic breakfasts there it would be great to see a review on here.. 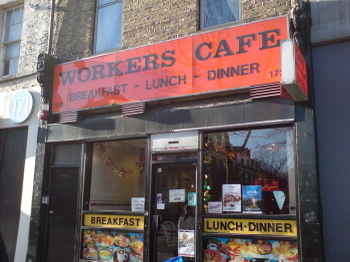 I LOVE Workers Cafe. Brings back some very fond memories. 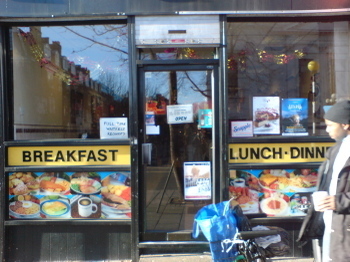 I used to live in Islington as a student in London in the early 90s and used to frequent this place. Excellent food indeed and affordable. Unfortunatel, we don't really have these great little 'divey' eateries here in LA. 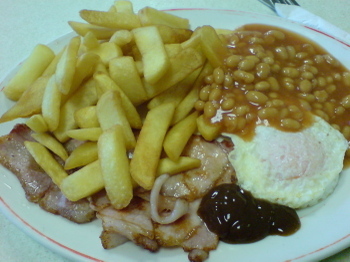 Makes me want to take a trip back to London just to have a good breakfast fry up! Just tried it this Saturday. Bloody brilliance. This was a favourite hangout for the IT personnel at Ebookers when it was located in the City.